The Multimeter-Calibrator METRAHIT MULTICAL is a combination of measuring transducer and measuring instrument. The combination of these two functions allows the process engineer to use this multimeter calibrator for many purposes. During the dual mode the multimeter calibrator simulates a measuring value and measures an electricity or voltage signal simultaneously. Display of measured and simulated values can be absolute or in percentages. Besides such values as electricity, voltage and resistance, the multimeter-calibrator can also measure temperature and frequencies. Furthermore the ramp function enables a continuous issue of calibration values between minimum and maximum values. 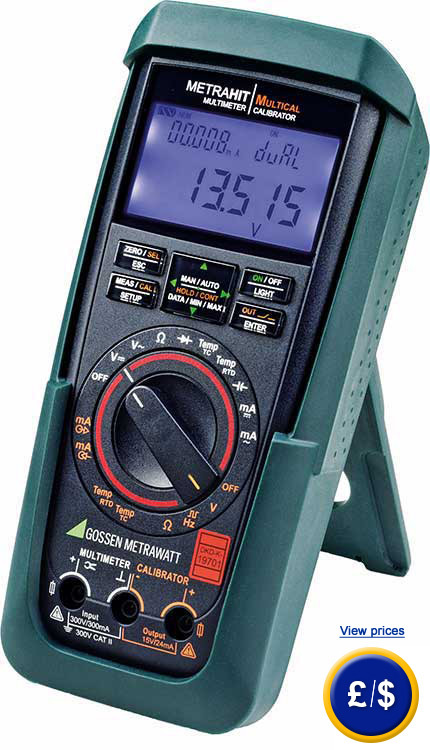 Additionally, the Multimeter-Calibrator METRAHIT MULTICAL can determine voltages, flows and resistance as well as capacity, frequencies and temperatures. As standard, the DKD calibration certificate is included. If you have any questions about this Multimeter-Calibrator METRAHIT MULTICAL, have a look at the technical specification below or contact us: UK customers +44(0) 23 809 870 30 / US customers +1-410-387-7703. Our technicians and engineers will gladly advise you on all multimeters and all products in the field of measuring instruments, regulation and control and scales. For using the Multimeter-Calibrator METRAHIT MULTICAL in mobile situations you can order a hard-shell case. This plastic case offers space for a multimeter-calibrator with equipment. Besides a comfortable transportation the case offers protection against mechanical damage. Owing to this case the multimeter-calibrator can be used in field service if needed.